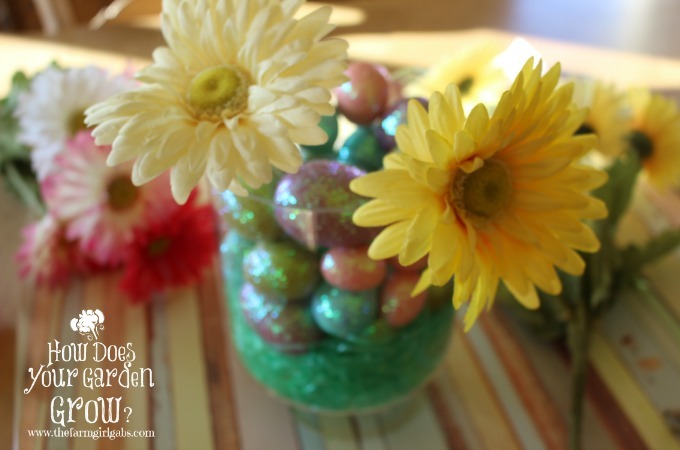 This beautiful spring centerpiece is easy to make and inexpensive too. 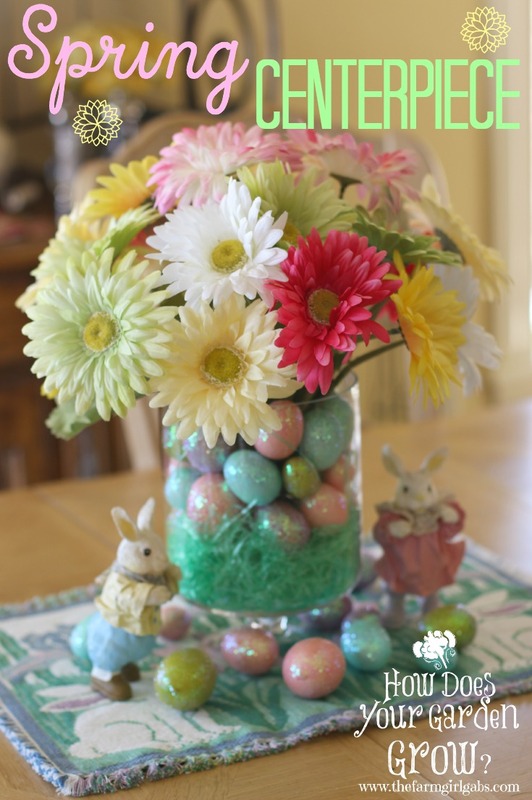 Learn easy steps to make this colorful spring arrangement. It’s perfect for Easter! I am so thankful that spring is right around the corner. While I enjoy watching the snow fall, from inside the comfort of my home, I am not a fan of the cold. This winter, cold was an understatement. Now that we are well into March, brighter and warmer days are ahead. With the change of the seasons from winter to spring, it’s time to dress up the house a little with some festive spring flair. 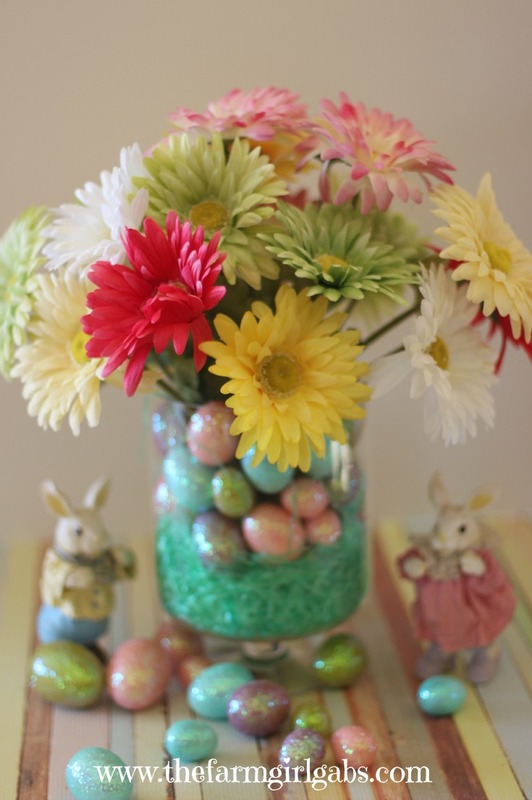 Today, I am going to show you how to make this Simple Spring Flower Arrangement. And no, it’s not hard. Trust me. You don’t need to be a floral designer to crafts this pretty table centerpiece. 3 Bunches of Spring Flowers. 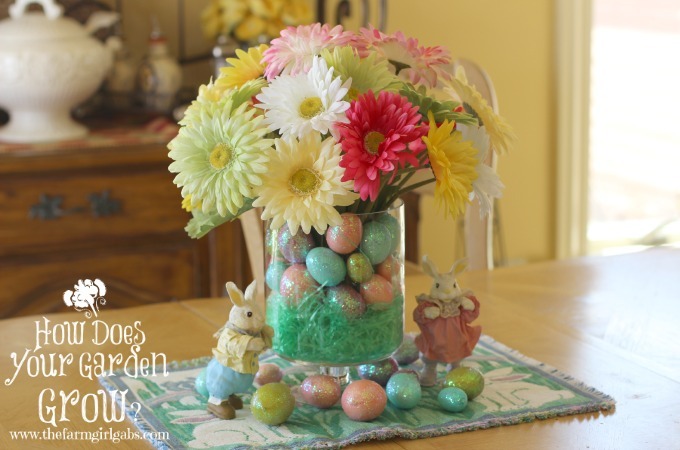 I used Gerber Daisies because they are my favorite, but any spring flower will do. 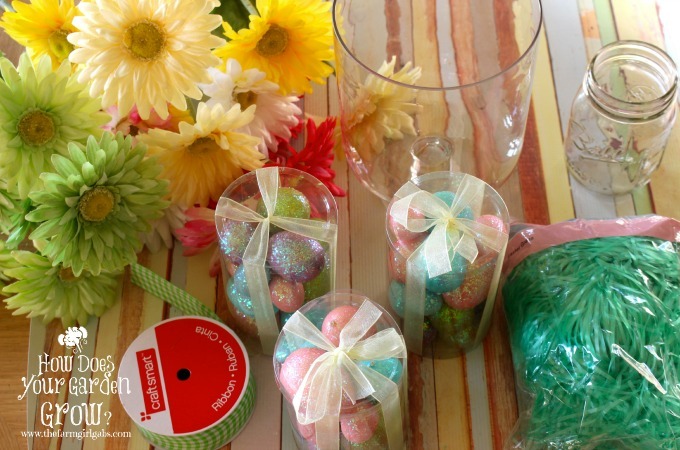 Plastic Decorative Easter Eggs . You will need at least 20. I used two of the three containers show above. 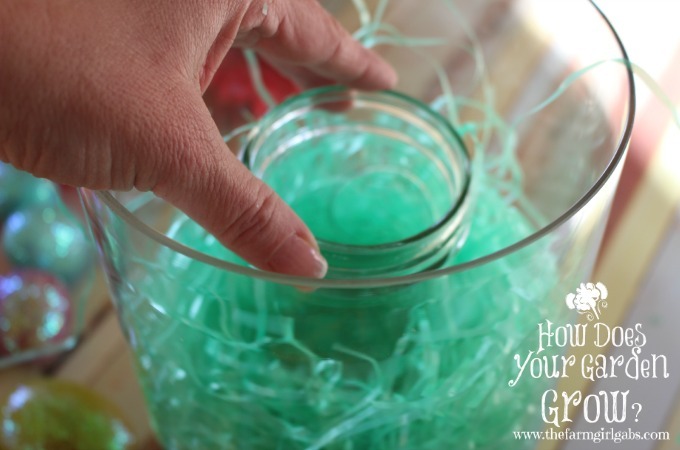 Begin by adding a good handful of Easter grass to the bottom of the cylinder. Fill it a quarter of the way. Then place the empty jelly jar in the center. 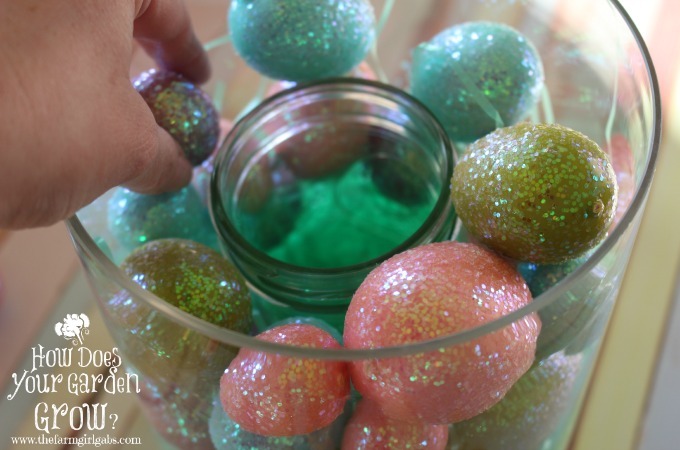 Start filling in around the jar with the Easter eggs. You can use whatever kind of eggs you like. Varying sizes work best. I found these pretty sparkly ones that I liked. Your centerpiece should look like this without the flowers. That step is next. Now start cutting the flowers off the bush and place them sporadically in the jelly jar. Space will be tight when you are almost finished but that it ok. You can add height to your arrangement this way. I just love the bright spring colors. Don’t you? This is a fun project. You can even get the kids involved. We all know kids love to be crafty. This project took me a whopping 20 minutes to complete. That’s it. No floral design experience needed. Just let your creative juices flow and have fun! 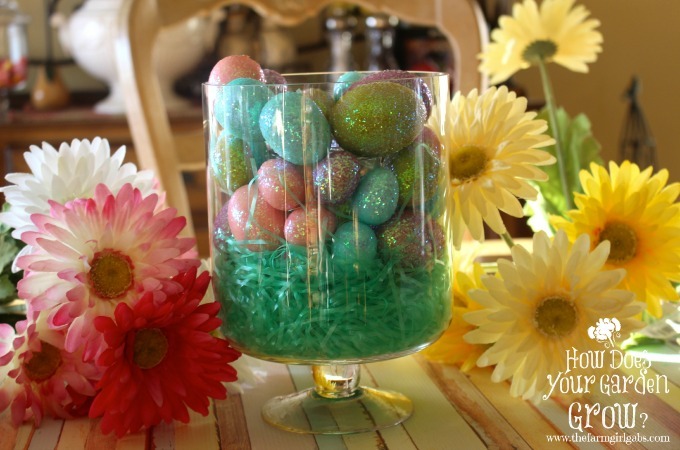 Looking for another easy spring decorating idea? 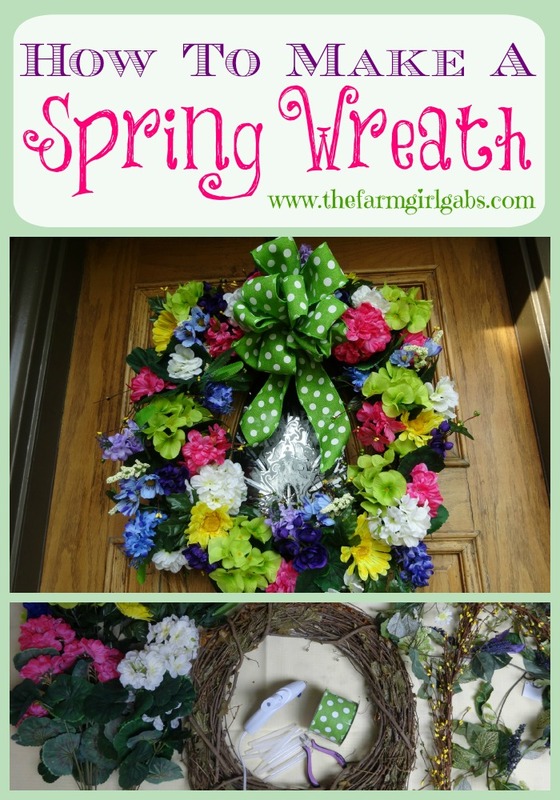 Check out my Spring Grapevine Wreath tutorial. It’s perfect for your front door!